Bass flute players frequently develop fatigue in the right arm when holding up the instrument. This problem is most prevalent during rehearsals when the bass is held up for long periods of time. Because the right arm is extended out from the body, it is difficult for back muscles to hold up the weight. Some strengthening of the back muscles can improve endurance, but there is also weight focused on the side of the right thumb. There are some adhesive cushions that can improve the discomfort in the thumb. Look under the performance aids category of a retail website to find these. Note from Flute Specialists: Try the Thumbport for Alto Flute or the Flute Gels. Click here to see our inventory of finger assists for both the right and left hands. Swimming is great exercise for strengthening the back muscles and improving posture in general. Contact a physical therapist about your individual issues. At the end of the article, there is a description of an exercise that I use to strengthen the back and arm muscles. For rehearsals, the easiest solution is to use a second music stand to support the end of the bass. 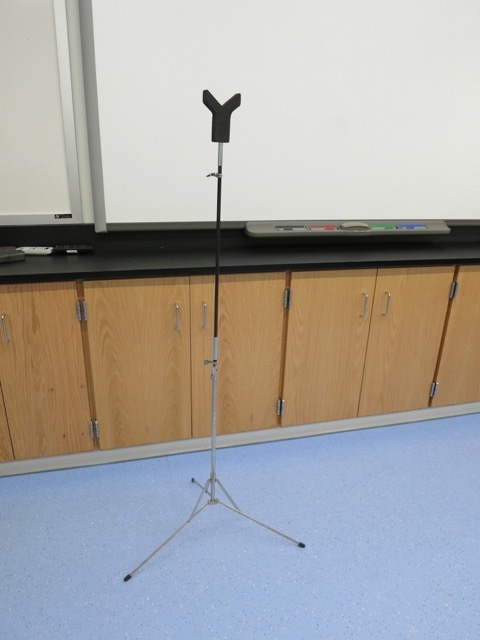 The first option is to use the kind of stand that has a solid music rack (commonly referred to as a “black” music stand). Turn the rack section upside down so that the ledge where the music usually sits is at the top. Place a thick cloth on this ledge and position the end of the bass on the cloth. You can raise or lower the height of the stand to suit your needs. The second option is to use a lightweight folding metal stand (commonly called a “wire” stand”) and nestle the flute into one of the joints of the music rack on top of a cloth. Here is the link to a YouTube video I have made demonstrating these solutions. Note from Flute Specialists: See our full inventory of music stands here. Also, check out this Roi Flute Resting Pad. There is also a device called a Bass Flute Lap Crutch that has been developed to solve the arm fatigue problem. It is also demonstrated on the YouTube video mentioned above. Some of these crutches have quality control problems, like the adjustment screw does not tighten enough to hold the rod at different heights. The main problem with the crutch is that it is not attached to you or the flute and you need a free hand to grab it quickly when you lift the flute off. Look under the performance aids category to find this product. Note from Flute Specialists: We just added a Bass Flute Crutch to our inventory. It is possible to construct a bass support from rigid, hollow, plastic pipe available at hardware stores. If you have some construction skills, or know someone who does, this would be a good project. The simplest form of the support would require two pieces of pipe glued together. One length of pipe would go from your right leg up to where you want the flute to rest, and a second short piece of pipe cut in half length wise would form the cradle in which the flute lays. The extra stand and the plastic tube support we hope to only need at rehearsals. They take up extra room that isn’t always available and they are not particularly attractive for the audience to look at. When I am working on piece, I practice sitting down with my support in place, but always transition to playing with no support as I get closer to a performance. As a soloist, I usually play standing, so supports of any kind are not a realistic option. Some people have had luck adapting supports made for other instruments. Bass clarinet stands seem to be a good fit. They can provide both a spot to rest the end of the instrument when playing and a place to put the instrument down when not in use. Those wire stands mentioned above can also be repurposed by constructing a padded support in the shape of a “y” that attaches to the top of the rod instead of the music rack. Myra Fox, an attendee at the 2016 Alto and Bass Retreat, came up with this solution to holding up a bass or alto. One brand, Kotato, has solved this support problem for bass players. They have designed the body of the instrument to include screw threads on the bottom under the F key. The maker provides an adjustable rod with a threaded swivel joint which screws onto the threads. The flute is free to move around because of the swivel joint, a decided advantage over the plastic tube construction mentioned above. A small leather foot on the opposite end of the rod sits on the chair between the player’s legs. The new Sankyo bass is also working on a support system using a neck strap but it still needs some improvement. Note from Flute Specialists: You can see Kotato alto, bass, and contrabass flutes here. Also, see the full line of Kotato Alto Flutes here. Also, check out the DiZhao Vertical Bass Flute here. I would like to encourage you to join the low flutes Facebook group which frequently discusses these and similar issues. Just put “low flutes” in the search field. I am interested in hearing about other people’s solutions to this problem so I can pass information along. Please contact me if you would like to share your ideas. chris@chrispotterflute.com. Here is a description of an exercise that I use to help me strengthen my back. Take a stretchy exercise band and wrap part of it around the doorknob on the outside of a door. Flatten out the rest of the band and position it across the edge of the door above the latch and close the door with part of the band sticking out on the inside of the door. Stand sideways to the door and hold the taut band with your outside hand. With the elbow remaining in contact with your waist, rotate your lower arm out until there is resistance. Do sets of 10, then switch to the opposite arm. You will find this improves your posture as it as strengthens your back. Dr. Chris Potter will be teaching a series of online workshops through New York-based company LessonFace beginning January 30th. A video is made of each workshop which is available to those who register before the class starts. The video can be watched at anytime, day or night, for at least one year, beginning the Monday after the class. Chris Potter is an internationally recognized alto and bass flute expert. 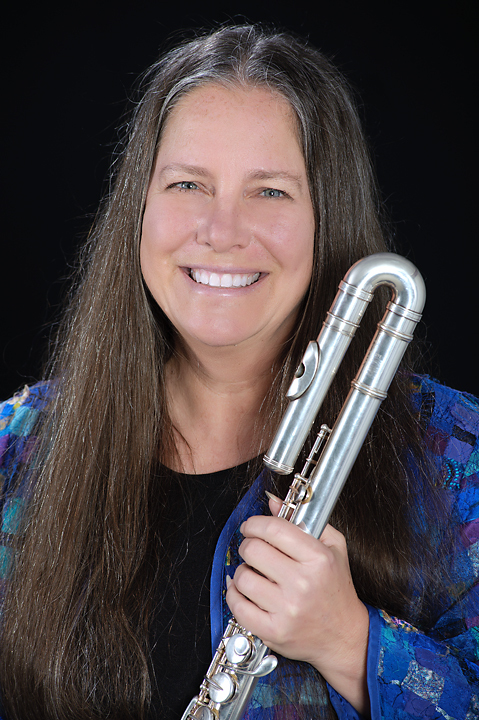 She was the first chair of the National Flute Association’s Low Flutes Committee and has commissioned and premiered many pieces for alto and bass. Performances have been presented in all major US cities, and in Paris, London, Toronto and Mexico City. Her numerous books are published by Falls House Press and British publisher Kevin Mayhew. She has numerous helpful videos on bass and alto on YouTube, and her 12th Alto and Bass Flute Retreats will be held in June in North Carolina and Colorado. Chris is also the Flute Choir Coordinator for the James Galway International Flute Festival in Switzerland.